One hundred years ago – November 1915 – Canada had passed the one year mark in the Great War that would continue for another three long years. In Orpington, England, a hospital commissioned by the Government of Ontario was under construction, and applications were flowing in from Ontario doctors and nurses who hoped to serve at their new military hospital overseas. 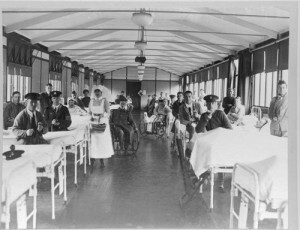 Earlier that year, Ontario Minister of Education, R. A. Pyne, had sent a telegram to Prime Minister Sir Robert Borden stating that “the Government of Ontario has decided to offer to establish and maintain a hospital of 1,000 beds in England for Canadians.” The government paid $2 million for the construction of the Ontario Military Hospital, which officially opened in Orpington on February 19, 1916. The hospital was staffed solely by Ontario medical professionals, who treated over 25,000 soldiers there between 1916 and 1919. In 1917, the hospital was renamed the 16th Canadian General Hospital. The original facility was torn down in the 1960s and replaced by the Orpington General Hospital, which now honours its heritage by featuring a Canada Wing and Ontario Ward. The Archives of Ontario is commemorating the centenary of this unique Ontario Government contribution to the WWI effort by highlighting the Ontario Military Hospital in its new online exhibit. This exhibit is being launched for Remembrance Day and features the story of Dr. L. Bruce Robertson, a surgeon from the Hospital for Sick Children in Toronto, who pioneered blood transfusions for wounded soldiers while serving in the Canadian Army Medical Corps. To view the exhibit, please visit http://www.archives.gov.on.ca/en/explore/online/Robertson/index.aspx. This past summer, Mackenzie Warner was a Project & Communications Assistant at the Archives of Ontario.